The Skinny: Surprising low-key drama is well-made and thoughtfulboth rarities for a Hong Kong film. While nothing new, the result is a worthy, albeit minor effort. The world of Hong Kong reporters gets a mild exploration in this thoughtful drama that's surprisingly decent. Emil Chow stars as Sorrow, a veteran reporter who's stuck in a dehumanizing grind. 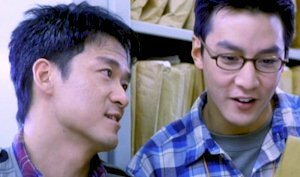 He's long since lost any scruples he might have had, and is too busy chasing juicy leads to pay attention to new recruit Peter (Daniel Wu). Peter is a neophyte reporter fresh from the states, who still has that amusing "idealistic" view of being a reporter. He tracks down a story involving a young woman (Grace Yip) who's raising her two brothers alone, but his good intentions create more problems than he realizes. Rounding out the trio of journalists is Joey (TVB star Maggie Cheung Ho-Yi), who gets involved with a young triad while trying to write a story about him. image courtesy of Chinastar Entertainment, Ltd.